Texas’ westward search during the 2019 cycle landed several key members of its #fUTure19 class. 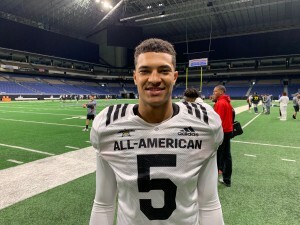 Today, after a brief cardinal and gold detour, the Longhorns landed arguably the biggest prize from expanded recruiting efforts on the West Coast. 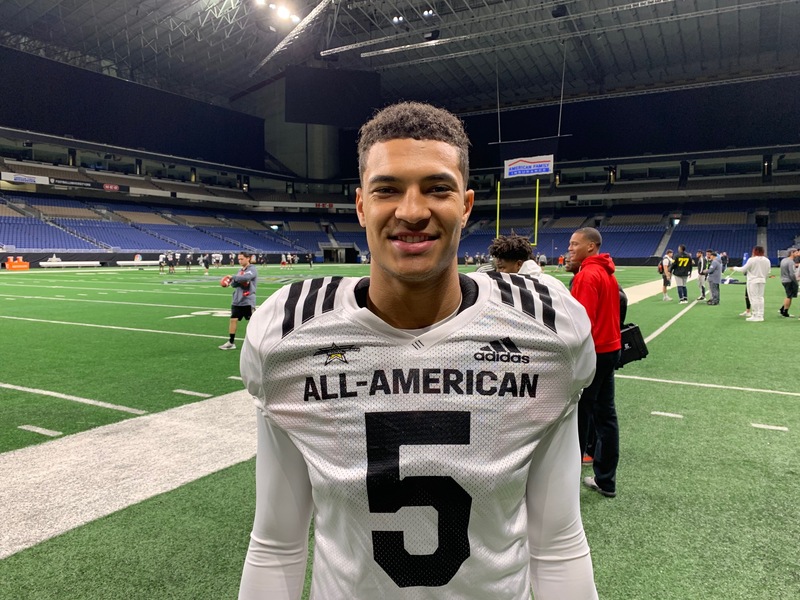 2019 Santa Ana (CA) Mater Dei ATH Bru McCoy chose to transfer to Texas today after a short stint at Southern Cal. Coach says: Strengths – A muscular and well-proportioned athlete. Excels at two difficult positions and is a very unique player. As a receiver, shows excellent acceleration off of the line with outstanding, fluid hips. He runs a variety of pass routes with ease and to perfection all parts of the field. Shows good understanding of defensive coverage and likely has a large repertoire of option routes already. Will stack double moves convincingly and seems a nightmare to cover at the high school level. Beats press and off coverage. Beats double coverage (hi-lo and inside-out). Catches the ball away from his body with soft hands and natural catching motion at all angles. Tracks the ball well and adjusts to the flight. Has excellent lower body explosion. Acceleration is outstanding as is change of direction with minimal loss of speed on direction change. Open field running shows very good vision and is a home run threat from anywhere. Finishes plays with good nose for the end zone. Shows some real ankle-breaking moves on film and is violent in engaging DBs as a runner. HUDL shows one stiff arm and it was great. Rare for one tackler to bring him down without a sideline to help. A more-than-willing run blocker, he is a true asset in the run game and I expect this will translate into explosive plays for running backs who can get to the second level. As a linebacker, shows the same explosion off the edge and I can find no opponent highlight tape featuring him failing. At anything. There does not appear to be a high school tackle on his schedule that can pass block this player 1-on-1. He accelerates through the ball carrier and arrives a “truckload of angry” causing disruptions of thrown passes as well as five sacks and 6.5 TFLs. He is a remarkably productive player tallying 14 receiving TDs on 57 catches with numerous explosive plays on his resume. Plays at an elite football program and has played with and earned the respect of former teammates now at the college level (Amon-Ra St. Brown and JT Daniels). Convinced me I was wrong to say that no one could break my man-crush on Jake Smith. I think we can love both. Other serious contender for services is USC and they have some turmoil. Areas for Improvement – Not much to say here. Stops legs on contact in traffic. His size is a bit small for OLB depending on what package they want to use him in. Not a lot of film of him playing the run and he seemed more situational at OLB. He and coaches have to agree on his role(s) here. McCoy is the 24th member of Texas’ 2019 class joining Isaiah Hookfin (Dulles), Kennedy Lewis (Melissa), Caleb Johnson (Fullerton College – CA), Jacoby Jones (Butler C.C. 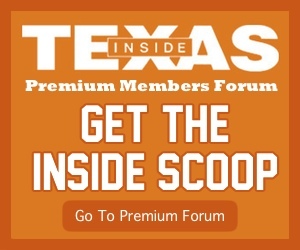 – MO), Myron Warren (Many – LA), Marcus Washington (Trinity Catholic – MO), David Gbenda (Cinco Ranch), Tyler Owens (Plano East), Derrian Brown (Buford – GA), Javonne Shepherd (North Forest), Marcus Tillman (Jones – FL), Marques Caldwell (Alvin), Chris Adimora (Lakewood – CA), Peter Mpagi (George Ranch), Jake Smith (Notre Dame Prep – AZ), Jared Wiley (Temple), Tyler Johnson (Conroe Oak Ridge), Brayden Liebrock (Chandler – AZ), Kenyatta Watson II (Grayson – GA), De’Gabriel Floyd (Westlake – CA), Jordan Whittington (Cuero), T’Vondre Sweat (Huntsville), and Roschon Johnson (Port Neches-Groves).